You may not think of salmon when visiting the redwoods in Muir Woods, but it’s home to a population of Coho Salmon. Redwood forests provide ideal salmon habitat, providing woody debris to protect young salmon in the creeks and keeping them shaded and cool. But the Coho in Muir Wood’s Redwood Creek are endangered, and local biologists and volunteers are working to protect the salmon and restore their habitat. For a map, driving directions and satellite views of this park from Google™ Maps, click here. Salmon are one of the iconic species of the West, but today it’s a species in trouble. Coho Salmon, also known as silver salmon, are listed as an endangered species. In the 1940s, California’s population was estimated at 200,000 to 500,000. In just 50 years, that population has declined about 90 per cent. California’s Chinook Salmon are also in trouble. The commercial fishery has been closed for the past two seasons, due to record low numbers of salmon returning to spawn in the Sacramento-San Joaquin River system. Coho range from California all the way to Alaska. As Muir Woods Biologist Michael Reichmuth explained, the Coho Salmon in Redwood Creek have been known as the southernmost stable population – but now that stability is questionable. Fish surveys have shown lower numbers of returning salmon every year. If you see someone snorkeling in Redwood Creek as you walk through Muir Woods, don’t be alarmed. Reichmuth conducts fish surveys throughout the year, and sometimes searching for juvenile salmon requires a mask and snorkel. These surveys are critical for assessing the health of the Coho population. The Park Service relies on volunteers to help with this effort, who walk the length of the creek looking for spawning salmon. Salmon are built to spend their lives in two different worlds – in streams and rivers and the open ocean – and they can face pressures in both places. Coho return to reproduce the streams and creeks they were born in, so many of the populations are genetically distinct from each other. 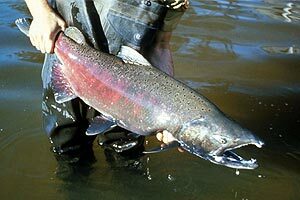 After reproducing, female Coho lay their eggs in redds – nests they dig out of gravel in river beds. After hatching, juvenile salmon stay in the creeks and streams for about 16 months, eating insect larvae and growing to five to six inches. They then migrate to the open ocean, where they live until they’re three years old. This is the end of their life cycle, when they swim back to into the creeks in December and January after winter rains to spawn. 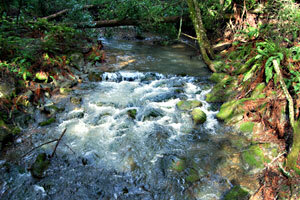 As Muir Woods Nursery Manager Chris Friedel says, if you see a perfectly straight creek, then it’s not natural. Redwood Creek has been molded by human forces for the past century. Local farmers straightened the creek to help with flood control and in the 1930s, the Civilian Conservation Corps undertook several projects remaking Muir Woods, including restructuring Redwood Creek. As scientists are learning, that flooding is key for the survival of salmon. When creek level rises, young salmon are able to reach a new food supply. They need woody debris like fallen redwoods for shelter, especially during the rainy season when water flow speeds up. Replacing the fallen trees and restoring the meandering course of the creek has been a major focus of the restoration. Today, there’s a volunteer effort lead by the Golden Gate National Parks Conservancy and the National Park Service to restore Redwood Creek both in and outside Muir Woods. Join the Muir Woods National Monument photo group on Flickr to share your photos of this amazing place.